Boasting its existence since 1870, Daytona Beach’s historic Beach Street area is home to many quaint family-owned businesses like the Davidson Bros. citrus shop (which only opens its doors during citrus season) and Evans and Son Antiques and Jewelry. 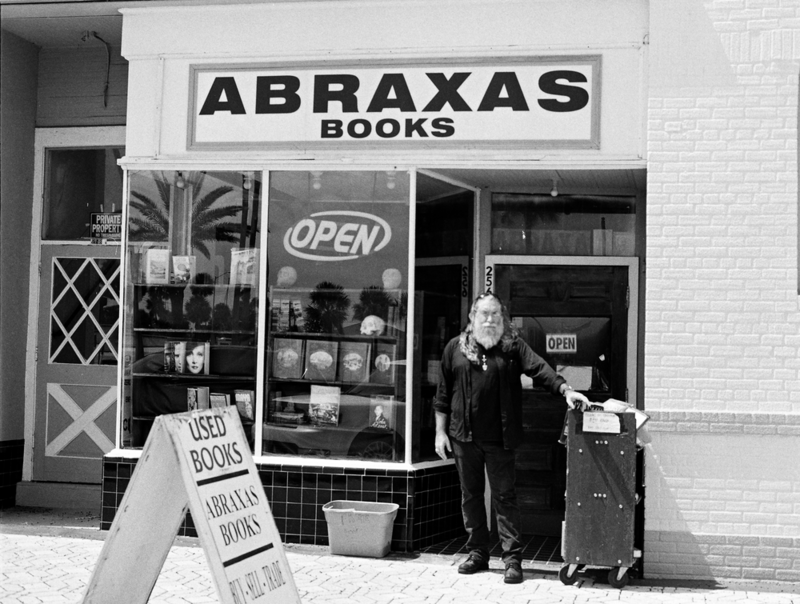 One of the shops, opened in 2000, is Abraxas Books, a voluminous store that specializes in used books of all subjects. From the bookstore, you can see the Volusia County public library, the Fire Department, and the Halifax River, an intracoastal waterway that divides Daytona’s beach from the mainland. I found James Sass, owner and founder of Abraxas Books, a half-block away from the bookstore looking at used books in a woman’s truck. She had mountains of them piled on top of each other, and had come to see if he was interested in purchasing any of it. “Most of these people have stuff I’m not interested in,” he told me later, “but you never know.” Struck by the heat, I went inside the bookstore to wait for him to finish looking through the books. I roamed the aisles of books, noticed the categories. Daytona is not known to be a place for intellectuals, and yet here there are piles of books on philosophy, metaphysics, eastern religion. He has dozens of those large art books with pictures. For readers interested in the mystery of used books, Abraxas is the right place. Mandala Books (no longer in operation) was run by a couple from New York City, Sass told me. “They weren’t hippie generation, they were more like beatnik generation people. And I mean that very literally—they had a bookstore in the Lower East Side of New York in the late 50s and early 60s, and they literally knew these people, like Allen Ginsberg and Lawrence Ferlinghetti. I actually met Ginsberg and Ferlinghetti because they would come in to the bookstore.” The owners were “academic people, literary, pretentious.” Though Sass was young, they saw his obsession with books had proved quite competent. “When I read, I would always look at bibliographies and I would compile my own reading list. I would come in and [the owner] offered to help me find the books on my list. She said, ‘this is a really good list. Where are you going to school?’ and I said, ‘I’m not going to school. I work in a kitchen.’ I think she said something to the husband—he was an interesting guy. Completely shaved head, Ukranian-Jewish background, from New York. Kinda blunt, hard-edge. Imagine Harvey Keitel if he shaved his head and had a little bit of a gut and these piercing blue eyes. He really intimidated people, but I grew up around intimidating people so I wasn’t intimidated by him. But one day he was like, ‘what are you doing with your life?’ This is what he says to me as I’m buying a book, and I said, ‘nothing, reading books, that’s what I’m’ doing with my life.’ He goes, ‘How would you like to work here?’ and that was it. For the next eighteen years (with the exception of a short stint in South Carolina), Sass worked at Mandala Books. He was there so often that many patrons mistook him for the owner. In 2000, he left to start his own bookstore only a couple of blocks away. Sass has owned and operated Abraxas Books for eighteen years, and has seen the business of bookstores change completely thanks to the rise of the internet. He was, however, better prepared than most for the seachange. “Initially I was the only one there that could type. This is in the eighties, and most of the selling, like mail order selling of rare books, was through a trade publication called Antiquarian Book Weekly. I typed, so I learned how to describe books and I would do all the ads because I could knock out a whole two-page ad in like an afternoon, and that was precisely the part of it that transferred into being the internet. According to Sass, the internet made everyone aware of the rarity of certain books. Some bookstores who focused on what he calls “pseudo-rare books”, that is, contemporary first editions, realized their catalogue was not special. “The publishing industry overproduces. If there’s something that has any kind of interest at all, they’re gonna make hundreds of thousands of copies. So all these people found eighty percent of their inventory they were selling for a minimum of twenty-five to thirty-five dollars, once they were on the internet, it’s one or two dollars. That’s less than the postage. Those are the people who lost their shirts.” On the other hand, there were niche sellers with truly rare books. They made a lot of money—a book that was previously worth one hundred dollars could be worth six hundred if it was proven to be truly rare. That is somewhat true. Book sales are back up—about 10.8 percent since 2013. Amazon makes it easy to order a book, whether it’s new or used. However, print book sales from brick-and-mortar stores have gone down by $6 billion since 2007. There has been a slight upward curve in the business, but for someone like Sass who has been involved in book selling since the early eighties, the difference is stark, especially considering the advent of smartphones and tablets. People grow more and more dependent on the internet for news, magazines, and other types of content. Currently, e-books “make up around 30 percent of all book sales,” a market in which Sass cannot participate (and doesn’t want to). So far, this seems to be true. In a survey of over 300 universities worldwide, 92% of students said they preferred print books over their electronic counterparts. Naomi Baron, the author of the study, discusses student preferences in an interview with The New Republic. Digital screens seem to encourage distraction and produce “eye strain and headaches and physical discomfort.” Reading in print, however, has many positive elements, ranging from ease of discovering information, a feeling of accomplishment when adding a finished book to a bookshelf, and even the smell of a hard copy. “There really is a physical, tactile, kinesthetic component to reading,” Baron says. This bodes well for bookstore owners like Sass. It’s difficult to assess whether this is true at a global scale. Although the NY Times reports the number of independent bookstores rose by 21 percent between 2010 and 2015, in the past 20 years it has decreased by over 50 percent. 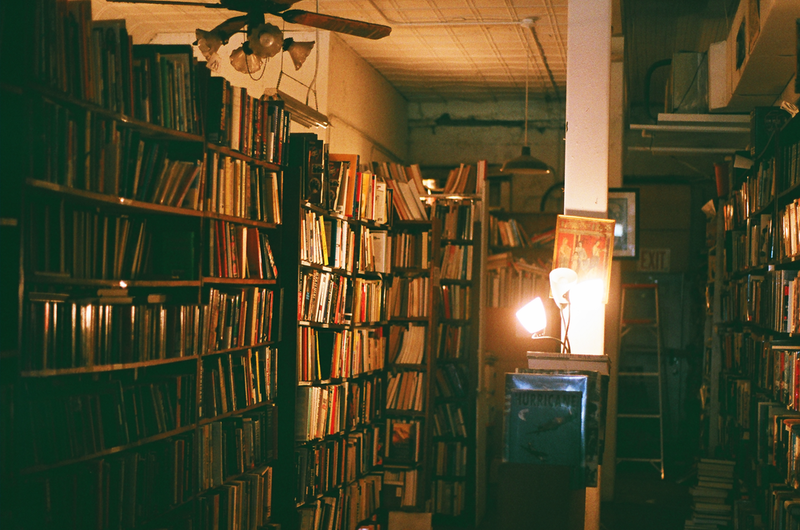 At the moment, less than 10 percent of book sales happen through independent bookstores. For a bookstore owner in Daytona, it doesn’t seem difficult to prove. Foot traffic in Sass’s store has diminished, and he is reticent to update his business tactics to fit the current book-selling economy. “I hate selling online. I do it, and I need to more than I do, but I don’t like it. It’s the least enjoyable part of my business.” Sass likes the back-and-forth he shares with customers on a daily basis. For someone who reads as much as he does, it’s the difference between animals on TV and a petting zoo. On Twitter, Sass describes himself as follows: “Radical Traditionalist. Hostile Witness. Autodidact. Bibliophile. Chess Enthusiast. Metaphysician. Cosmic Pessimist. Misanthrope.” When asked about this description, he laughed. “It’s funny but it’s true. It’s absolutely true. I laugh at myself.” In person, Sass is jovial and tactful. Online, he enjoys promoting a cryptic persona, one that intends to separate his past affiliations from his current mental and academic state. He worries that his online comments will catch up to him. “I feel like I’ve been lucky that it hasn’t gotten me in trouble,” he said. However, through his thorny exterior, Sass demonstrates a willingness to belong to a productive and positive society. He owns a business whose purpose is to educate and entertain people, and Sass is a staunch supporter of free thinking. “I’m an absolute freedom-of-ideas guy. In your mind—and I don’t care whether it’s a well-formed argument for or against anything, or if it’s some visionary experience—what goes on between your ears, behind your eyes: free reign. Have at it. It’s when you act it out that you have to take into consideration the people and the world around you.” This is how an intellectual sees the relationship between theory and practicality. There are things you ponder about, and others you act on, but reality has limitations that the mind does not. Follow Abraxas Books on Facebook.